Using a mobile device? Go to m.fastcompany.com for our mobile version. The massive profits and massive growth behind the Web's most annoying industry. 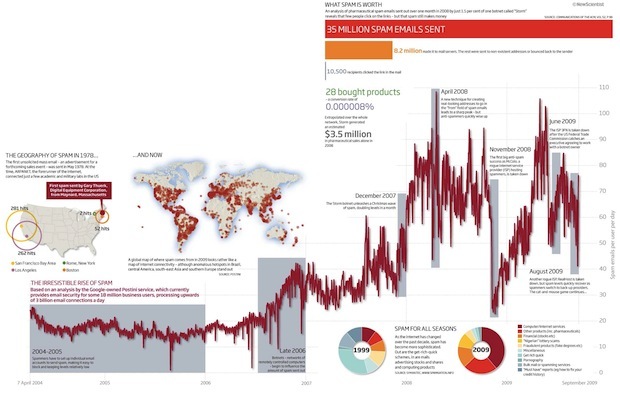 We all know that spam is huge, but this infographic by New Scientist offers a much closer look. Long story short: Preventing spam seems almost impossible, because the spammers are so nimble. They're also getting smarter. Here's an economic breakdown of one single (albeit massive) spam operation. Out of 35 million span emails sent out in one month, only 28 actually turned into sales. (Are you reading this, guy who will no doubt drop spam below this very post, likely in the form of ASCII "bear" or "battleship" art?) But if you extrapolate that out to the whole network, that comes to $3.5 million in earnings. Which is obviously pretty massive, considering that creating an entire botnet like this one to send the emails would require just a couple diligent hackers. Spam is evolving quickly, as people become more savvy to classic scams. We've more away from blatant get-rich-quick schemes--and into more subtle ones, like promises for financial services. You've got to shiver at the possibility that one day, spammers will become super smart, using, for example, lessons borrowed from behavioral economics to tune the perfect pitch. For more detail, check out the full-sized graphic. 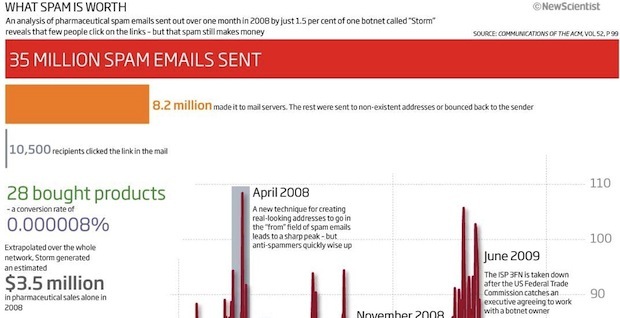 And then check out this slideshow filled with graphics showing how spam has changed over time. Infographic of the Day: Is Owning a Dog Worse Than Owning a Hummer? "Out of 35 million span emails sent out in one month, only 28 actually turned into sales." Who's Cashing In on Health-Care Reform? Harvard Business School HBS prepares you to build success—one decision at a time. Apply Now. Learn why GREEN is the new color of your bottom line. Register Now! Microsoft Office Buy Office Small Business 2007 now. Be extra productive. Learn more. Get more leads Pay-per-click puts your business at the top of search page results.